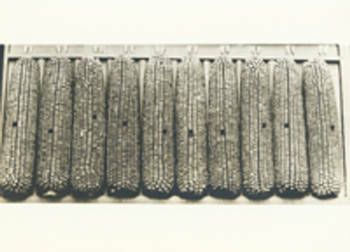 John Gleason's prize-winning corn (or maize) in the Grand Champion Sweepstakes at the Ohio State Corn Show, 1925. Maize is another name for corn, a cereal grain. Originally, maize was a wild plant, but American Indians in Central America eventually domesticated it and improved on the wild variety. In the wild, maize originally consisted of a plant that could grow as high as twenty-three feet and that only produced a few small kernels. Between seven and twelve thousand years ago, American Indians in Central America began to domesticate maize, creating a plant that could produce hundreds of kernels of corn on each cob. Today, most domesticated maize plants grow to a maximum height of nine feet. The domestication of maize dramatically changed life for American Indians. Many American Indians societies in Central and South America became sedentary. Before maize’s domestication, these people were primarily hunters and gatherers. Now maize provided these people an abundance of food, and they no longer needed to move as the animal population became depleted due to hunting. In North America, including in Ohio, American Indians remained migratory, but they increasingly grew maize, which extended the amount of time that their groups could remain in one place. Europeans learned to plant maize from the American Indians, and corn quickly became a staple of the Europeans’ diet. Today, farmers grow maize all over the world. In Ohio, corn producers held 174 million bushels of corn "in all positions" on June 1, 2005. It is a leading crop in Ohio today.